Now that the Boston Red Sox have rebounded from an atrocious beginning to the 2015 campaign and are back in the American League East race, talk about the club landing a frontline starting pitcher by the July 31 non-waiver trade deadline is again percolating. A new set of trade chips in Boston’s deep farm system could be played to acquire that arm. Last offseason, trade chatter regarding the Red Sox and Phillies left-hander Cole Hamels centered around highly regarded young players like shortstop Xander Bogaerts, outfielder Mookie Betts and catcher Blake Swihart. Understandably, Boston general manager Ben Cherington refused to part with the trio, and all three have been part of the club’s 2015 starting lineup (though Swihart is currently on the 15-day disabled list). Hamels is still in a Phillies uniform, and the 31-year-old left-hander is pitching effectively with a 3.02 ERA, a 1.13 WHIP, 9.5 strikeouts per nine innings and just 35 walks over 17 starts and 113.1 innings. The Los Angeles Dodgers, Chicago Cubs, Toronto Blue Jays, Houston Astros and New York Yankees are among the other potential destinations, but the Red Sox can likely build the most enticing package of prospects to meet the asking price of Phillies GM Ruben Amaro Jr.
Boston has five players in Baseball America’s recently released Top 50 Mid-Season Prospects List. Yoan Moncada, the 20-year-old second baseman from Cuba, is No. 11. Rafael Devers, an 18-year-old slugger who is a third baseman and could be moved to first base, occupies the No. 15 spot. Manuel Margot, a 20-year-old center fielder who the Phillies have closely watched, is No. 24. Brian Johnson, a 24-year-old left-hander out of the University of Florida who is thriving at Triple-A Pawtucket, is No. 38. Fellow lefty, 22-year-old Henry Owens, is No. 47 and is in Pawtucket’s rotation with Johnson. A package for Hamels would likely include Johnson or Owens, Margot or Jackie Bradley Jr. (another Red Sox minor leaguer the Phillies like), and Devers (who could rapidly ascend to the majors in Philadelphia like fellow Dominican Maikel Franco). Names like catcher Christian Vazquez (who is rehabbing from Tommy John surgery and will be out until at least May 2016), Javier Guerra (a 19-year-old shortstop) or Deven Marrero (a 24-year-old shortstop who is currently with the Red Sox) could also be included. With the presence of top young players like Bogaerts, Betts, Swihart, 22-year-old left-handed starter Eduardo Rodriguez and Cuban-born center fielder Rusney Castillo, Cherington can afford to part with the aforementioned top prospects, though trading Devers would sting. 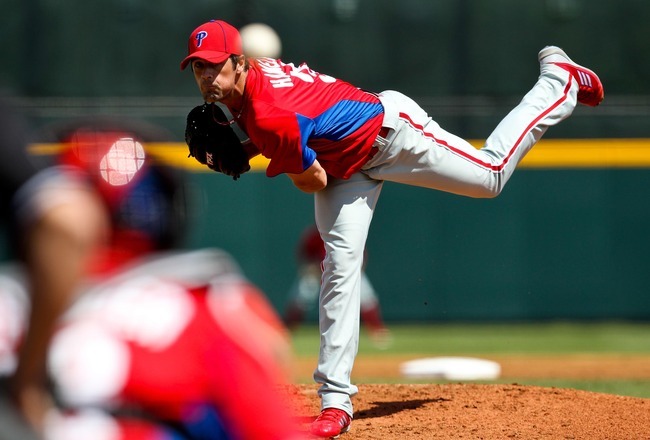 Hamels is an appealing trade target because he is a proven No. 1 starter with post-season experience, and his contract terms are set through 2019. He is receiving $23.5 million this season and is slated to get that salary through the end of 2018. For 2019, he has a $20 million team option, a $24 million vesting option (which locks in with 400 innings pitched in 2017-2018, including 200 in 2018; and if he is not on the DL with a shoulder or elbow injury at the end of the 2018 campaign) or a $6 million buyout. Considering the lengthy and costly deals that Jon Lester and Max Scherzer signed last offseason; and what free agents to be Johnny Cueto, David Price and Jordan Zimmermann will command in the upcoming offseason; Hamels’ contract does not seem so cumbersome, especially for a club searching for a clear-cut ace.